The nice thing about living in the "burbs" is that you can run to the grocery store and then make a quick left at the Botanical Gardens to catch a few quick shots. I walked around for about half an hour and enjoyed the warm late afternoon sunshine. The last roses of summer are fading, but some still beautiful and sweet smelling (see below). The leaves are almost ready to put on a grand show in the very near future. I especially liked this scene with the sprinkling of golden brown leaves all around. Oh, I'll be back! OK, I haven't dressed up for Halloween since about the 7th grade. That said, in a weak moment I let Wayne talk me into being Natasha to his Boris today. We are both so O.L.D. that we forgot until a while ago. In case you are wondering, YES, Natasha and I have similar figures! In fact we look very much alike except for hair color of course. Now who wants to be Bullwinkle??? Anyone??? The Tune du Jour is "Young at Heart" by Frank Sinatra. Why you ask? Because going to Paris really is a fairy tale come true! As many of you know, I have embarked on an unofficial "100 Strangers Challenge". The object is to help photographers feel more at ease at approaching strangers and asking to take their photo. It's daunting I can tell you. The hardest part of the challenge is that you must have some type of interaction with the subject. You MAY NOT sit in your car and snap photos from afar! Hence the challenge. I have shared a few with you along the way, but today I want to highlight one that is very special. Meet my friend Herman. He is a character for sure, but he is also a proud man that I consider myself lucky to have met. Somewhere on that hat is an Olympic pin that I shared with him. He accepted it as a token of our friendship. He returned the favor by saying, " You can take my picture, now." The bottom photo is one of a series of photographs of hands that I hope to share as a series in the future. Herman.... thank you for allowing me to make your portrait. You are a stranger no more. It's not every day that you go to the Bimingham Museum of Art and bump into the master himself! Several weeks ago the museum threw a Family Day and look who showed up? Leonardo da Vinci schmoozed with the kids and greeted visitors as they came in the front door! Everyone in town is excited about this special collection of his drawings that have never before traveled as a collection from the Biblioteca Reale in Turin. The works include one of his most celebrated notebooks, the Codex on the Flight of Birds and 11 other important drawings. The exhibit is unusual in many respects. Because the drawings are small and detailed ( you can actually see each and every stroke of his stylus) , the viewer is allowed to get extremely close with a magnifying glass. This invites a very personal experience between the observer and the artist. The room is kept darkened somewhat with a chilly temperature of 62 degrees F. To highlight the theme of the flight of birds and some of his horse drawings, the museum invited the Birmingham Zoo to bring birds which everyone enjoyed seeing in the Sculpture Garden and horses from the Birmingham Police Department were a favorite in front of the museum. In addtion, art activities were provided in the main lobby area for the kids. What a great way to introduce children to the wonders of art and make them feel comfortable visiting our museum. Tomorrow, I will be a volunteer inside the exhibit for the first time. It will be a very chilly 3 and a half hours, but getting to view the drawings as much as I'd like is a good trade off I think! Postscript: Grazie to my friend Fabrizio, who taught me that he is referred to as Leonardo, not da Vinci. He explained that "da Vinci" merely means that he is Leonardo of Vinci. Merci beaucoup to my friend D.C. Confidential for sharing the BFF AWARD! You have raised the bar for me in so many, many ways, and I thank you for that. You are talented, articulate and passionate about what you believe in. I hope to follow your example my friend. My daughter Kathleen and I almost share a birthday. Hers was yesterday and mine is tomorrow, so I thought we might celebrate in the middle today! I stopped by Angels Cakes and Confections in Crestline Village and photographed these gorgeous cakes. Well, I know they are wedding cakes, but let's pretend. Not only did they rearrange the shop for my photo "shoot", but I got a delicious cup of coffee as well. I am including a portion of the gelato selection so you can have some with your cake. Happy Birthday Kat! Oh, and the number of candles on our cakes? Well, my lips are sealed, what about yours, Kat? And my present you ask?? Well I am giving myself a grand one this year. I won't be able to open it till around 9:30 a.m. on November 17th in Paris! The specialty of the house is a delicious caramel cake. It's a southern favorite. I might need one of those when I return from Paris to lift my spirits! The Tune du Jour is one of my very favorites, " The One I Waited For" by my dear friend Michael Dulin. Who else would I ask to play at our party??? A special THANK YOU to Petrea and Dusty Lens for your most appreciated BFF Awards. I so enjoy your friendship and your wonderful photographs and posts each and every day. I must confess that I am of the "pre soccer" generation. I didn't grow up playing it. Well that's an understatement, I hardly played Kick Ball. It's only been in the last 20 or so years that I gave it much thought. Now it's all the rage in Birmingham, and our Chappell, age 5, is finishing up a rather stellar season. I got to photograph the last game for these two Vestavia Hills teams yesterday. What kind of a Mumsie would forget her 300mm lens????? I will blame that on fatigue. That said, I did the best I could with 8 cute 5 year olds running all over the field, and spilling over into the adjoining field as well! As I said , I don't know much about soccer, but I don't remember 3-4 coaches all out on the field ....well "herding cats" again. My daughter Kathleen was one of the coaches/herders. She said that it's needed to help keep them "on track". Well that's the truth! You might notice that there are boys and girls on the same team. When did that happen??? In the end, they had a terrific time, showed great sportsmanship, worked as a team, and to my untrained eye, looked pretty skilled! Congrats to our Chappy and her teammates for a great season! Discover The Mamas & The Papas! Yesterday, I spent a wonderful day at Sweet Peas Garden Shop showing some of my photographs at their open house/art show. The best part??? Spending the day with some very dear friends and enjoying a crisp, breezy autumn day seeing old friends and making new ones. Of course I couldn't pass up some incredible photo opportunities. Today I include two. Which is your favorite? The top photo is taken of a bird bath . The colors and reflection caught my interest. The bottom photo was shot straight up through my very favorite southern tree, the dogwood. I am thankful for this lovely day well spent! The Tune du Jour is "Autumn Leaves" by Willie Nelson . I love his version! PARIS COUNTDOWN..... 21 DAYS !!!!!! A very Happy Birthday to our friend Abe Lincoln at Brookville, OH Daily Photo. Thanks Jay Gilbert for helping me find this one! Photographer's Rule # 1 ..... NEVER leave your camera at home. If I had today, I would have missed this fabulous lady! Another "museum" shot. I get at least one every week, I promise. There I am being the cheerful but not terribly knowledgable exhibit greeter today, and I look up and this lovely lady, along with some of her friends came right by me. After I told her how gorgeous she looked in that spiffy hat with the bright green feathers, I flew downstairs to get my camera. They were having a birthday luncheon for one of her friends in the museum cafe, and I knelt by her chair ( I was prepared to grovel) and asked if I could take her picture. She cheerfully agreed and made sure I got her new handbag in the shot. She asked me what I would do with it, and I told her with any luck at all she would be on the internet by morning. She laughed and said she didn't even HAVE the internet!! Thank you Miss Terry for making my day. By the way, her friend told me she's quite spirited. I already knew that! An urn of luscious fall colors from The Arbor. Enjoy! Yesterday, I was totally taken by surprise when I received the "Blogging Friends Forever" Award from Blognote, who posts each day the most remarkable, professional photographs of his beautiful hometown, Arona,Italy - aronaeverday.blogspot.com Grazie Diederick, my friend. I am honored to be chosen by you. I added a 5th. I chose bloggers that had not been previously honored with other awards in order to "spread the love"! A fine group of talented photographers and writers, but most of all friends whom I have enjoyed learning from and getting to know. The Tune du Jour is a bow to Blognote. "Caruso" by Josh Groban. and Tash at Palos Verdes DP, that they have also given me the honor of this award. I gratefully accept but have asked them to let someone else choose the 5 blogger friends in my place. Thank you Marley and Tash! Question: Do these awards make my head look big???? On Monday, I posted a photo of the beginning of the walking trail at Jemison Park in Mountain Brook. Alice of Arradon, FR Daily Photo requested, "tout au bout". Since I am writing this in the evening, and all of my French blogging friends are fast asleep halfway around the globe, I am going to attempt to translate: at the end! Excusez moi if it's not quite right. When this post goes up, I will be snoozing, and they will be at their computers and will hopefully offer corrections if needed. Regardless, here's the lovely end of the trail. Not the Pont Neuf or the Seine, but a photogenic stone bridge with Shades Creek slowly running through it. So there you have it- a lovely and peaceful ending to a glorious autumn walk this morning! The Tune du Jour is one of my very favorite soundtracks... "Prince of Tides". You might want to stay a while and hear it to the end. You're welcome to you know! Discover Klazz Brothers & Cuba Percussion! The Tune du Jour is "Chances Are" by Johnny Mathis. This will bring some wistful smiles from those of you around my age. Memory Lane indeed! It pays to clean out the basement every once in a while. I moved the Christmas tree and uncovered this family treasure. This is Nonna's bike. Nonna is the beloved grandmother to my two daughters. At close to 90, she doesn't ride bikes anymore, but she is still an active member of her church and community in Slater, Iowa. The daughter of Swedish and Norwegian immigrants, she can still make killer Swedish meatballs and the most delicious kringla you have ever tasted. She mails a coffee can of kringla to my girls every so often. We fight over every one ! Nonna, we are keeping your bike safe and sound. Maybe one day your five adorable great-grandchildren will be scootin' around Birmingham on it. I'll take pictures, I promise! Ooohhh, I know what you're thinking. Some great guy sent Virginia these gorgeous flowers. Well.... not really. But I did the next best thing. I bought them for a gathering of some very special neighborhood friends, and now I have these golden blooms brightening every corner of my home. This small bouquet sits right beside my computer, so I can enjoy it day and night. Why don't we treat ourselves now and then? I love fresh flowers. What am I waiting for?? Maybe I'll start throwing a bouquet in my grocery cart once in a while and share it with a friend. For today, it is a pleasure to share the sunshine with each of you! The Tune du Jour is "That's What Friends Are For" by the fabulous Dionne Warwick! The bell tower at Highlands United Methodist Church, in the Five Points area, is probably one of the most photogenic ! You may remember this unique and beautiful church from an earlier post here, and the reason that this church is close to my heart. This is where they serve breakfast to the homeless and those in need, six days a week. One morning when I was standing outside chatting with some of the breakfast guests, one of the men told me all about the chiming of the bells and how beautiful it was. He was very pleased that I stayed around long enough to hear them. Indeed he was right. A heavenly sound that brightens the days of all those that hear it. A blessing to the community in more ways than one. To see all the other Skywatch Friday participants around our world, go here. You are in for a treat. The Tune du Jour is " The Highlands" by Michael Dulin. Doorway to the Past OR The Door to Nowhere! Indulge me a little. Anticipation is getting the best of me and so today, we will leave Birmingham for just a bit, and have a Paris moment. 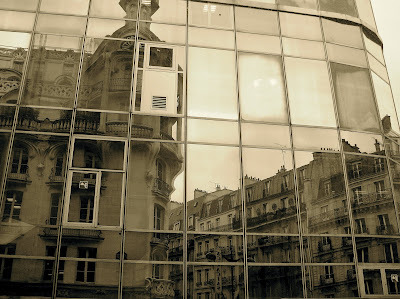 Taken in 2007 through a store window in the Latin Quarter, this is one of my favorite photos from my first trip to Paris. PARIS COUNTDOWN .... 31 DAYS! The Tune du Jour is " Hymne A L'Amour" by Josh Groban. For many of you the leaves on my header are unfamiliar. Oakleaf hydrangeas are native to Alabama and one of my favorites during the spring and summer. An added benefit is that when the blooms die and dry , they take on this crisp brown color. Many southerners dry the blooms all summer to use in their homes during fall and winter. Their rich red leaves are the added bonus right before they bid us a farewell. Today's offering is a before and after of sorts. I thought you might like to see some of the gorgeous greenish/white blooms of summer and the new look they have taken on recently. These were both photographed in the wonderful Southern Living garden at the Birmingham Botanical Gardens. The Tune du Jour is a very jazzy version of "Autumn Leaves"
The other day Ming I asked on his NYC blog, "So have you seen any live shows lately?" I gave an emphatic YES. Saturday I was in the audience for the Birmingham Children's Theatre's performance of " The City Mouse, and the Country Mouse" in the Wee Theatre. Now one of America's largest professional theatre groups for young people, this fabulous (non profit) group performs year round for schools and the public. They don't just hang around in Birmingham all the time either. They take it on the road for schools across the state that otherwise would not have access to live performances of this calibre. I received the grand tour of every nook and cranny backstage by their exuberant Director of Development and Marketing, Nancy Jones. If Nancy can't get you excited about BCT, nobody can! I have been invited back to photograph rehearsals and behind the scenes action. I can't wait. Saturday, the audience was a lively group of youngsters and their parents. I think this four mouse cast got a standing ovation at the end, but it's hard to tell with that many wiggly kiddos in one place! Afterwards in the lobby, the cast signed autographs and posed for pictures with each and every child. Birmingham is so fortunate to have the BCT in our midst. What an asset to our community. PARIS COUNTDOWN ... 33 DAYS! Volunteering at the Birmingham Museum of Art yesterday paid off. I had my camera with me (of course) and was finally at the right place at the right time. The glass wall and trees outside made for an interesting effect, but the gentleman in the hat was who I was after. What a catch! Up until a few days ago I thought I was going to have to let this TWO THINGS CHALLENGE pass me by. Thanks to D.C. Confidential, who kindly gave me a few hints, I am able to be a team player this week. Merci my friend. Here goes: This gorgeous red Chinese basket and vase are obviously my EAST, and these well worn and nicely polished cowboy boots are my WEST. There you have it! CONGRATULATIONS ARE IN ORDER! The American Institute of Architects has a new series titled THE SHAPE OF AMERICA. In the category highlighting the St. Louis Arch, I am sure you can guess that our very own Strangetastes from St.Louis Daily Photo captured 14 out of the 19 photographs that they selected. Recognition well deserved! We however, can see a fabulous Arch photo each and every Thursday. The Tune du Jour is "L'hymne a l'amour" by Romane. Stick around and give this one a listen. You'll like it! Meet my little friend Lilly. I taught with her Mommy and loved her before she was ever born! I must say she was one of the most delightful subjects I have had the privilege of photographing. She laughed and clapped and mugged for the camera like a professional model! Right now Lilly lives in a world of silence, but soon she will have surgery that will allow her to hear the sound of birds singing and her Mommy and Daddy's sweet voices. For now, she wears this cute pink cap to keep those pudgy little fingers from pulling out the teeny tiny hearing aids she wears. Lilly, you are perfect in every way! The Tune de Jour is "Lullaby" by Michael Dulin. If I asked Lilly's parents for a request, I know it would be "War Eagle" and you can find that on the sidebar. Well it is! With a yard full of trees, the squirrels have lost their ever loving minds. All day and night the nuts are hitting the roof, sounding like they're up there throwing bricks. Oh, and the pinecone buffet is causing some kind of litter on the patio. There are nuts on the front porch that I am sure they have placed carefully so I'll slip and "buy the farm" some morning soon when I go out to get the paper. Abe my friend, I know this is all very upsetting for you, and if I could round em all up and ship them to Ohio, you would have more mouths to feed than you could shake a stick at. For those of you looking for a more positive perspective on squirrels may I suggest Brookville Daily Photo. The Tune du Jour is appropriately.... "Goin Out of My Head" by Little Anthony and the Imperials. A real favorite of mine. Good times remembered. Discover Little Anthony & The Imperials! Those of you that live in cities like Paris, Madrid, New York, Monte Carlo and San Francisco, probably won't understand what it's like for the rest of us who struggle every day to make our cities look, shall we say more "photogenic". Putting a positive spin on our hometown is why we are all here. Heaven knows if you want to see the seedy side, folks can just open the newspaper or click on the tube! Last night when leaving the museum, I realized that this waterfall between the Birmingham Museum of Art and the Boutwell Auditorium, not the most glamorous by day, had taken on a very dramatic look when lit up for the evening. It reminded me that maybe I need to be out and about more at night. The Minneapolis DP delegation is my inspiration! Not as sharp as I would like, but it was hand-held, braced on a wall. f/5.6 , shutter speed 1/8, 34mm, 800 ISO for you photojunkies out there. I am sure there were numerous setting errors. I am sticking with my usual excuse - haste and in this case- darkness. By special request, Michael Dulin's "Siren Song" has been added to the line up today ! I found a new antique store the other day. Christopher House is located in the Pepper Place antique district. The afternoon sun was streaming in the high windows and I wanted to photograph everything it touched. Not my usual subject matter, but it was all about the light. These antique candleholders with their beautiful prisms made for some gorgeous reflections. Timeless indeed. The Tune du Jour is "The Poet" from Michael Dulin's album Timeless. Click the arrow to play. Thanks to Dusty Lens for helping me embed the player right here. Now each post will have its own player and you can hear the Tune du Jour whenever you visit! The Object of My Obsession- I Mean Affection! Well I always say, "You can't be too rich or too thin, OR have too many books about Paris! Just when I think I have enough already, the guys at Amazon.com send me these friendly little emails telling me they have handpicked a few more that I won't be able to live without. So here they are in my office all stacked up in the morning sun begging to read and poured over for my trip next month. Sometimes I think one of the best things about a trip is the anticipation and the planning of it all. It's 40 days and counting, and I'm starting to realize I really am going back to Paris! Peter, Alice and Marie, we can hardly wait to experience Paris with you! For now, so many books, so little time. The Tune du Jour is for my friend Mary who is mad about Paris as well. Wish you were goingwith us. Next time mon amie! "La Vie en Rose" by Patrick Saussois & Richie Cole. A very French song with a decidely American kick. Do I hear a fiddle??? Even in Alabama, summer's over. Good bye fresh peaches, home grown tomatoes and the Pepper Place Market every Saturday morning. Hello craft fairs, pumpkin displays and scarecrows sitting on haystacks. Sure it's hot enough to be summer , but it's just time now to "play" fall. My last chance to post this picture of my little friend from the Pepper Place. He was there almost every Saturday with his grandmother and other relatives. He usually hung out in the back of the truck with a load of cantelopes and as the summer wore on, watermelons. Sometimes when I'd stop by and ask, "Where's my little buddy today?" Grandma would say, "Thank goodness he's asleep in the truck!" He was a tad busy as we like to say. One Saturday his dad even had him on a kiddie leash! The day I took this photo, Grandma was behind him hollering, "Smile for that lady!" After I was done, he took off like a flash. I contemplated chasing after him, but someone told me that everyone looked out for him and he'd be just fine. I can't wait till next spring to see how he's grown. Maybe I'll be able to trick a smile out of him next year! So long my little buddy, so long summer! You frequent visitors will probably remember that we had a plethora of celebrations around here last week. My Laura Kate and Davis both turned four (born a day apart - YES! to different moms). This week's Two Things Challenge is Solid/Pattern. While the rowdy little guys were jumping their brains out on the "Pirate Jumpy Jump", all the girls decided to turn the brick sidewalk into a work of art. Each SOLID colored brick became a gorgeous PATTERN! Bottom photo shows Davis eagerly anticipating getting to make a wish and blow out the candles, so he can dive into that pirate cake. Click here to see the creative folks participating in TWO THINGS CHALLENGE! What a fabulous group of outside the box thinkers they are. Bravo! The Tune du Jour is "Somewhere Over the Rainbow" by Isreal Kamakawiwo. I love this medley!! After my post (here) about The Arbor, some of you requested to see more of it. Blognote wanted a peek at the courtyard so I was happy to have an excuse to go back for another photo shoot there. Today, two fountains from The Arbor that I think you will enjoy. "To find joy in work is to discover the fountain of youth"
The Tune du Jour is " Nocturne" by Michael Dulin. If you're from the south, this title makes perfect sense. For the rest of you I'll try and explain. "Que" is short for Bar B Que, that slowly, slowly smoked delicacy that we southerners are passionate about. We prefer pork but also enjoy chicken. Beef need not apply. We're finicky about our sauce too. It needs to be red with lots of vinegar, not sweet or mustardy. There are many great Bar B Que places around town. Today I feature two of them. I am not playing favorites, well maybe a little, but I promise to show you more in future posts. Full Moon Bar B Que at the top takes the prize for the best logo. I smile every time I drive by this one on southside. They are known for their spicy relish they add to their sandwiches and the Half Moon cookies. YUM! The bottom photo is the Golden Rule in Irondale , it is near the original restaurant started in 1891! Not long ago I was enjoying a sandwich and spotted Booker ( "the pit master") flipping those Boston butts on the pit. As soon as I finished eating I asked to take his picture. Behold the artist at work. Like I said, in Birmingham, it's all about the Que! Several months ago I posted a photograph of the interior of Continental Bakery here. I mentioned that this bakery, reminiscent of a French boulangerie, was located in an area called English Village in the suburb of Mountain Brook. Some of you chuckled at a place called English Village that had such a charming French style bakery. Today I show you the outside. English? Mais oui! The Tune du Jour is a special one. Last week I featured my friend and talented musician (here), Michael Dulin. I am happy to report that you can now sample his music and make a playlist on Deezer.com . I can also treat you to his music right here on my blog. The Tune du Jour is "The One I Waited For". I especially chose this song because not only is it a personal favorite, but the one he waited for is a very dear friend as well. Enjoy . CDP THEME DAY - LINES / Herding Cats! This is a loose interpretation of LINES! I shot this at my church as a class of 3 year olds did their very best at walking down the stairs in a LINE! The term "herding cats" sprang to mind. I could hardly hold the camera as I attempted to keep from laughing AND help Miss Brenda get them ready for the ascent, "hands on the railing." There you have it- sort of a line. The bottom photo is my favorite. This is my precious next door neighbor who was the first to arrive at the bottom. I caught him after he had a few spins around the cross. Click here to view thumbnails for all participants of City Daily Photo Theme Day! The Tune du Jour is "I Walk the Line" by Johnny Cash of course!